We recently heard about the new Samsung Galaxy E7 and Galaxy E5 smartphones, and now it looks like we have more details on the Galaxy E7. 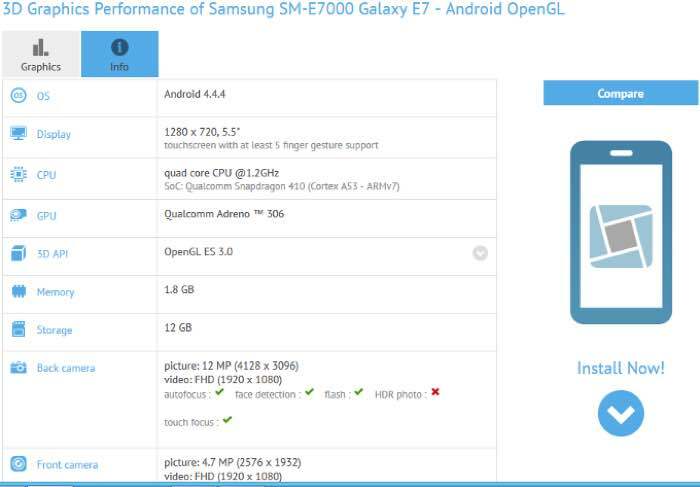 The Samsung Galaxy E7 recently appeared in the GFXBench benchmarks, and this confirms some of the specifications we heard about the device previously. The Galaxy E7 will come with a 5.5 inch High Definition display with a resolution od 1280 x 720 pixels, the handset will be powered by a quad core 1.2GHz Qualcomm Snapdragon 410 processor. Other specifications in the Samsung Galaxy E7 smartphone include an Adreno 306 GPU, 2GB of RAM and 16GB of included storage, the device will also come with front and rear facing cameras. On the front of the Galaxy E7 there will be a 4.7 megapixel camera for video calls and selfies, on the back of the handset there will be a 12 megapixel camera and the device will come with Android 4.4.4 KitKat.